A traditional Celtic Claddagh cross necklace adorned with small heart symbols along each arm, along with the Claddagh hands, heart, and crown emblems. Cross measures over 1 7/16" tall (or 1 13/16" tall with hoop/bail) x just under 1" wide. 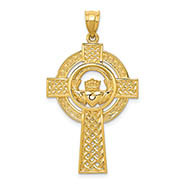 See our unique collection of quality Celtic crosses. 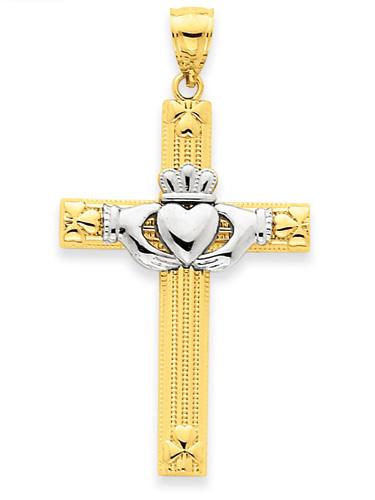 We guarantee our Heart Claddagh Cross Necklace, 14K Two-Tone Gold to be high quality, authentic jewelry, as described above.